Feng Shui utilises cures and enhancers to deflect negative energy/Qi and to increase positive Qi, for example; a Ba Gua mirror. Each year we work out where to place a cure or enhancer in your home. The primary objective of this is to help you improve the quality of Qi throughout your own house. These cures and enhancers prevent any forecasted problems or misfortunes to help you enjoy a magnificent year. On a bigger scale, however, cures are also used on buildings for the same reason. A poorly structured and positioned construction can affect the entire neighbourhood either positively or negatively. When planning construction, a Feng Shui architect will look at not only the land but other surrounding buildings. She will also note the direction of any mountains, rivers, lakes, oceans, etc. The architect will take all of this into consideration before sitting at the drafting table. If there’s anything in the immediate locale that could create an issue for the building and business, they would place an object on the exterior such as a cannon. The cannon would deflect the negative energy. This ploy is widespread in China (mainly Hong Kong). Look at the buildings in this image. 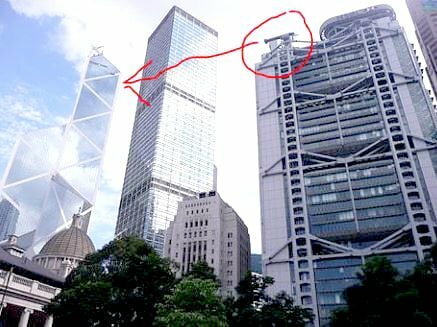 The building on the left is the Bank of China a disaster from the start. Classified a failure with its negative energy ‘knife-edge’ pointing directly at the HSBC Bank (on the right). The Building also has negative ‘X’ shapes running up the sides. The construction was anticipated to cause economic stress. This stress would not only affect the HSBC Bank but also surrounding buildings and their businesses. Along with the disastrous structure, the original plan was to open on the auspicious date of 8th August 1988. The number 8 translates to ‘fortune’ and is a favourable number in Feng Shui. However, there was a delay in completion and the building eventually opened on the inauspicious date of 15th June 1990. The predicted slump in the economy was realised so the HSBC Bank, on the right, took action. They erected a cannon to serve as the ‘cure’ right on the top of the building. The cannon was aimed directly at the Bank of China to deflect any negative Qi. The building in the middle is the Cheung Kong Centre. This building was constructed to balance out the energy between the two rivalling banks. The skyscraper was built to allow good Qi to flow unhindered from the mountains and around the buildings. These cannon objects are often disguised to look more like satellites, air vents, or radio antennae. This image was kindly sent to Michael by Sofia, one of his clients. 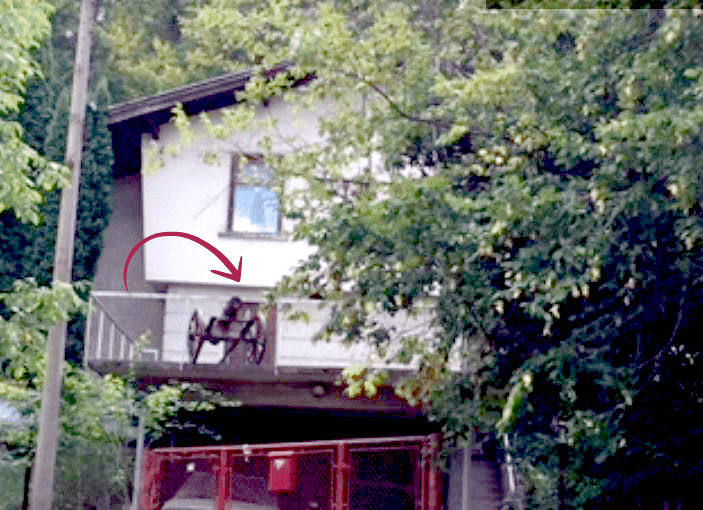 This Bulgarian property has a cannon perched on the balcony. Michael’s conclusion is that this could be a Feng Shui countermeasure against a problematic neighbour. So, you’ll see the benefit of applying the cures and enhancers not only on the interior of your home but also, equally as important, on the exterior. When setting up your annual Feng Shui Kit spend time looking around your environment. Look at the properties surrounding you; is there anything that could reduce the quality of Qi flowing into your home? We’d love to read your comments below or if you have any concern regarding your home or office. Hi, my colleague is hanging a chicken head n a 关帝公 that facing me. According to my other colleagues said, she mentioned she hanging that to make me bad. If I put a cannon point to her direction to resolve the bad intention, am i very bad? A cannon is a very powerful Feng Shui cure and should only be used on a building or similar rather than a person. I would recommend creating some sort of screen to block the sight of the head if possible. Hi, my main door was built facing front neighbour’s Ensuite toilet, my kitchen sink window is facing right hand side neighbour’s Ensuite toilet as well and our 2nd bedroom window is facing left side neighbour’s common toilet. I placed a ba gua mirror on top of my front door, obviously neighbour was not happy about it. What else can I use other than the ba gua mirror? For kitchen window, we tried to plant a tree and put up a blind. Frankly, the tree failed to grow and the blind fail to function. Our house are poorly designed without much storage area so you can imagine things hanging around every where. I can assure you that we have been putting a lot of stuff away but seems like still have many more. We encounter lots of problems in our life, social, health and work, you name it. Could it be all these things that causes the problems? I started your feng shui deluxe enhancer in 2017, and will get one for 2018 too. But what else can we do to make it really work? Please help. Tqsm! I would recommend placing a pair of Fu Dogs facing towards the problem areas as these work to protect your home from any negative energy. The best option would be to place them outside your entrance doors. If you have the 2018 kit, this covers all areas of the home and will definitely help. I hope this helps, Jazz and hope that things get better for you. I read somewhere that if your house over looks a school, it is very negative, it can drain your home of its resources. Is that true? would placing a cannon help to deflect the negativity? I would recommend placing a Ba Gua mirror outside your home. The type of school will usually decide what kind of influence it has on your home; if you live opposite a nursery, this tends to be more innocent energy although if you live opposite a high school or secondary school, this can be more of a negative energy although this varies with different schools.